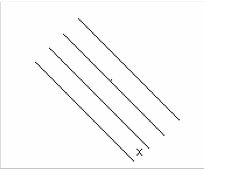 Figure 3: Ship running mowing the lawn pattern so the footprints overlap. From this data, the depth and contours of the ocean floor can be determined. I also asked P.S. Shyla Allen about the problems and sources of error associated with this data collection. She responded by detailing three main issues that must be corrected when cleaning the data, i.e. the data must undergo three main correction factors before accurate readings can be analyzed. 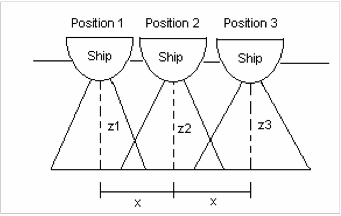 These three factors include: a) tide changes, b) sound velocity, c) the motion of the ship and GPS positioning. To correct for tide changes, the researchers must have accurate readings of the tides. Tide gauges are installed along the coastline at various points, and all readings are reduced to Mean Lower Low Water (MLLW). This basically gives the average of the lowest possible depth at a given location. To correct for sound velocity changes, which is the most important correction factor dealt with, researchers take measurements of water temperature and salinity level at the given depth reading. For every change of 1 ppm in salinity, there is a change of 3 m/s in sound velocity. Therefore, salinity is perhaps one of the most important factors. Finally, the motion of the ship and GPS position need to be corrected for. This includes correcting for the pitch, roll, and gyration of the ship as well as error in the GPS system. Because the ship uses Differential GPS (DGPS), this error is already accounted for. 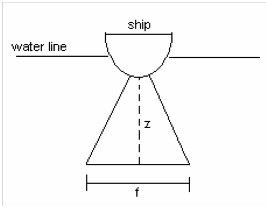 However, for the pitch, roll, and gyration of the ship, two antennas are used to on the port and starboard sides. These antennas, often referred to as Motion Reference Units (MRU), are very stable feed into the same computers that process the data. Therefore, the computer takes into account the readings from these antennas and combines this information with the corrections made for the tidal changes, sound velocity factors, and positioning of the ship. After cleaning the static from the data, a nautical chart can be produced. This method of charting the ocean floor is definitely more efficient than when researchers used lead lines—long ropes with lead that would be dropped down and then measured to determine the depth! I woke up this morning after sleeping for about 12 hours—I think the seasickness medicine I took last night made me very sleepy. Luckily, however, all traces of seasickness are gone; I can even sit here at the computer and type without noticing the pitching of the ship very much at all. I think all of my muscles must be getting stronger as a result of reacting to the changing ground and all of the stairs I go up and down every day. I spent some time on the bridge this morning mostly asking questions about the tools used there and what various measurements mean. I find it very interesting that simply reading tiny numbers and using small switches and knobs will run this 231 foot ship. However, my experience aboard ships tells me that it is not even close to impossible. I know that even the slightest adjustment at the helm on a sailboat can change the course of the boat. I am reminded of sailing in the British Virgin Islands and the dispute over if it was more important to maintain the way point or try to make the boat go very fast. However, that is not an issue on this boat. We are supposed to reach the Shumagin Islands tonight, and tomorrow we will start the launches—I can’t wait! How many sets of data points must be filtered out before the data is considered clean? On what does this number depend? How does one determine if a data point is an outlier or and actual reading? This entry was posted in 2004, Leyf Peirce, NOAA Teacher at Sea and tagged GPS, multi beam sonar, noaa ship rainier, Shumagin Islands, tide gauge. Bookmark the permalink.